The Commonwealth Games opened in Glasgow on July 23, so the blog is featuring a few Scottish names; today it’s Archibald. 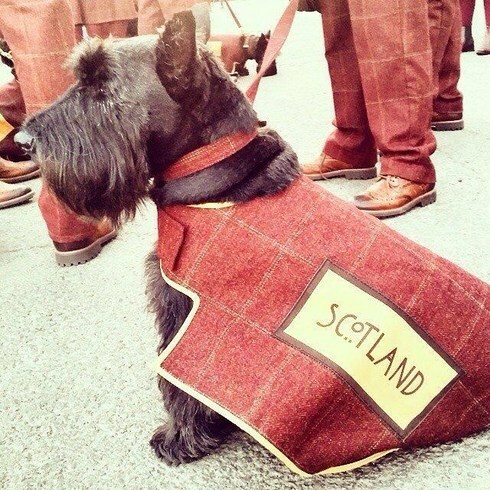 Everyone is talking about the cute Scottish terriers in tartan coats who stole the show at the Commonwealth Games Opening Ceremony, each one of them leading in a national team. I think it was a moment where we all went Awwwww …. The Scottie dogs were perhaps the only ones whose outfits were not scrutinised, because everyone wants to see whose team uniforms are the best, and worst. Australia traditionally fails dismally in the fashion stakes, and this year we were true to form, sending our team in unpopular outfits which were criticised as looking like something home-made for a Star Trek convention. I presume the Games Committee sent everyone a cover letter to let them know that Glasgow summers are usually mild, and can have the odd wet day. The Australian designer seems to have understood that as code for “you are entering a polar hell with perpetual torrents of rain”, as everyone was sent equipped with anoraks, woolly jumpers, scarves, snow hats, and who knows what else. As Glasgow is currently in a heatwave, this has led to well-deserved international derision. But like good hosts, Scotland has saved us from being the worst-dressed team by tactfully showing up in a lurid tartan mixture of bright blue, turquoise, fuschia, navy, caramel and mustard. Thanks Scotland – now our green anoraks with lemon piping, lumpy lime green jumpers, and baggy pants are only second place for ugliest uniform. The Games have got off to a good start for Australia – we’re currently on top of the medal table by a whisker, we’ve set several world records, and two of the Hockeyroos took a selfie with the queen in the background, and it went viral, so our horrible uniforms haven’t held us back. Archibald comes from the Germanic elements ercan (“genuine”) and bald (“bold”), and usually translated as “truly bold”. The first part of it was altered to make it seem as if it was derived from Greek archos, meaning “master”. The Normans introduced the name to Britain, and it quickly became popular in Scotland, where it was used to Anglicise the Gaelic name Gille Easbuig, meaning “servant of the bishop” (it’s also Anglicised to Gillespie). Archibald is a traditional name in the Clan Campbell, as their founder was named Gille Easbuig. As you would expect, there are quite a few Archibalds in Scottish history, including the fearsome-sounding Archibald the Grim, a 14th century Earl of Douglas and Lord of Galloway. The most powerful magnate in Scotland, he stood in higher stead even than the king. Because of him, the name Archibald became traditional in the Douglas family as well. The name Archibald is well known in Australia due to the Archibald Prize, which is awarded for portrait painting. It was founded in 1921 from a bequest from J.F. Archibald, the co-owner and editor of The Bulletin in the days of its greatest influence. J.F. Archibald was an interesting character from a naming perspective – he was baptised John Feltham Archibald, but changed his name to Jules Francois (pronounced FRANK-wa). This was considered rather pretentious, and everyone just called him “Archie”. He also professed to be Scottish, part-French, and Jewish, when he was actually Irish Catholic, which likewise afforded his peers great amusement. The Archibald Prize is known as “the face that stops the nation”, as it is Australia’s favourite art award. It’s very accessible, especially as many of the portraits are of celebrities, and gets a lot of coverage in the media. Many people are interested to know who wins the Archibald, and generally there is widespread criticism or condemnation for whoever the judges choose. Indeed, the Archibald has been almost continuously controversial, with several protests, disputes, and legal actions throughout its history. The Archibald Prize also offers two categories that are judged by non-experts: the People’s Choice Award voted by the viewing public, and the Packing Room Prize, awarded by the staff who install the portraits in the gallery. These prizes are more likely to be awarded to portraits of celebrities. It is possible to win the main prize and the other categories, but that rarely happens, and nobody has ever won all three at once. The Archibald is so famous that it has inspired two parallel art institutions. One of them is the Salon des Refusés (Salon of Rejects – shades of J.F. Archibald! ), an exhibition showing works which have been rejected for the Archibald. The prize for this is a People’s Choice Award. The other is the Bald Archy Prize, a spoof art competition for satirical portraits; the winner is supposedly chosen by a sulphur-crested cockatoo named Maude. Absurdist and irreverent, you can see the appeal to the Australian sense of humour; it’s an extremely popular art award, and heaps of fun. This year’s winner was a portrait of Mitchell Johnson in the guise of Miley Cyrus’ Wrecking Ball – a cheeky comment on his devastating performance in the Ashes. The name Archibald was #57 in the 1900s, and left the Top 100 in the 1920s; it left the charts in the 1950s. However, since the late 2000s, Archibald has made a slight comeback, and managed to chart several times around the 400-500s. In 2010, there were 11 babies named Archibald in New South Wales, and in 2012, there were 7 babies named Archibald born in Victoria. The reason for this mild revival? The short form Archie, which has been Top 100 since 2007, and is rising in popularity. If you want a long form for Archie, and you think Archer is too popular or too trendy or too modern or too surnamey, that pretty much leaves Archibald. Once upon a time, Archibald was perhaps rather fusty – a great-grandfather name smelling strongly of mothballs. But with the revival of vintage names, discerning parents may think it’s time for it to be taken out of storage. And why not? Archibald is a clunky yet strong name with a long history, and has an aristocratic image. It makes a great Scottish heritage choice, and also references one of Australia’s favourite cultural institutions. Honouring an Archibald in your family has never seemed so possible. Archibald would look dignified on a CV, and even a possible future knighthood makes Sir Archibald rather pleasing. Yet what could be friendlier and more democratic than simple Archie or Archy for everyday use? Archibald received an approval rating of 53%. 24% of people disliked the name, and a further 24% hated it. However, 20% of people loved the name. Great article, Anna. Your intro really made myself and family (who are on holiday in Wales) chuckle. I see quite a few BAs for Archibald. Unsurprisingly they are usually confined to Scotland or to the Upper classes. I think most of the birth notices I see for Archibalds are from upper middle class families (as best I can see), but it also does well in rural areas, which traditionally are very keen on honouring names. Also, the link I gave to a sportsman planning to use the name is from a working class region, so it’s probably more widely represented than you might think. I had a look at how Archibald is going in England/Wales, and saw it has been hovering around the 400-600 mark for several years now – I think not too dissimilar to here, so we might be following British trends.